In this article, we talk about Replacement Conservatory Roofs and Conservatory Roof Tiles in Newcastle by Stormshield Windows and Conservatories. Your conservatory is usually extra living space to make use of and a light airy room that you can use for may different things, living room, snug, study, dining room, playroom and so much more. However, a tired looking roof structure, or perhaps worse a broken or leaking roof structure, can spoil the look of the conservatory and often means you are unable to use it as its cold in the winter and too hot in the summer. A completely new conservatory roof and tiles are often the answer. Converting your conservatory roof to a light-weight tiled roof heightens the look of the conservatory, updates it to look new and modern and regulates the temperature inside, and this means you can use it, in comfort, all year round. We consider ourselves to be the market leaders in the manufacture of tiled lightweight conservatory roofing. We have investigated different roofing solutions and evaluated those that would work best for our clients and use the Guardian Warm Roof System simply because it is one of the most efficient roofing systems available in the market today. We have a group of specialist staff to make sure every fitting is performed in the most professional way. Utilising this replacement conservatory roof system, we’re able to replace your conservatory roof covering in only a few days. We have over 21 years of experience when it comes to conservatory roof replacements and tiled conservatory roofs. For additional information on upgrading your conservatory roof structure in Newcastle, give us a call on 01670 710050 and one of the team will be happy to help. Alternatively, take a look at our website where there are information and photos of what your conservatory could look like with a new roof and tiles. 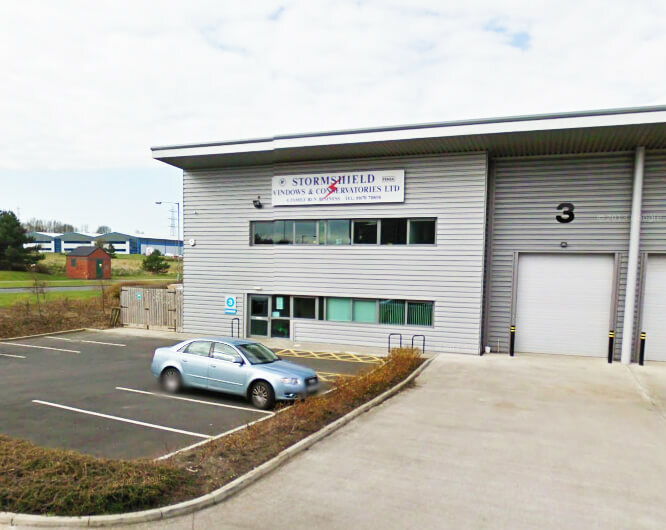 You can be assured of high-quality services from Stormshield as all of our installations have been certified by LABC, consequently, each of them complies with the terms and regulations for local buildings. We help you find solutions to any roofing concerns that you may have, thanks to our substantial knowledge of roof structure issues. Our team of trained industry experts are always on time, professional and polite and keep you as the customer in mind when undertaking projects. The whole fitting process takes about three days. The procedure requires the removal of your existing polycarbonate roof and updating it with a lightweight tiled conservatory roof structure. Once this is finished, you get a tiled roof on the outside and a plastered vault ceiling on the inside. The roof is fully insulated keeping it warm in the winter and cool in the summer. Our team are always on hand to offer you guidance and advice on the roofing system that will work best for you. A brand new tiled conservatory roof will be ideal as a replacement for a tired looking structure. We strive to provide all our customers with something they can be proud of for a long time. 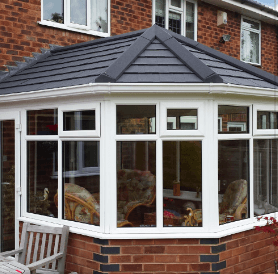 Do not forget that our tiled conservatory roofing product is one of its kind that is consistent with the UK’s building regulations. Take a look at our customer reviews and testimonials here. There is a vast number of roof varieties you can pick from. For each roofing style, there are specific advantages. Any service we provide is competitively priced and comes with a free no-obligation quote. We offer our services in Newcastle, the North East and surrounding areas and no job is too big or small for us. This is perhaps one of the most popular and vintage roofing styles around. When complete it looks fabulous. The style will ensure that you thoroughly improve your additional living space, no matter what the weather. This type of roofing style is compatible with most property styles as it is very versatile. This style is sought after by many people since it can be configured quite easily to slot in any conservatory roof design and style. It is good for kitchen extensions. What’s more, it maximises the space at the back of your house and increases the appeal of a room. The ends come in 1 to 2 inclines. It’s got good modern day styling with an increase of choices on the positioning of the doors and has a 3 aspect roofing design. This design can really be useful if you lack room within your garden. The internal plaster finish completes the design and gives your roof a sophisticated appearance. One of the main features of this design and style is the continuous elevation it can give a room. This style and design are perfect for roof replacing or the building of a new one. It comes with a long ridge at the centre that will enable you to make good use of the roof windows. This style is great for bungalows. It can be used for the renovation of an older conservatory that you might have. The design and style are highly recommended since it is very versatile and can be used in several ways. No matter what shape and size of your conservatory we can develop and install a custom replacement conservatory roof to complement the shape of your present conservatory. All the roofing tiles we use are made of Zincalume protected steel. This effectively means that you will get a high quality and sturdy roof covering. We’ll also take into account all of your suggestions on design and style to ensure you get what you’re looking for. We can happily say that we have developed an outstanding relationship with all of our past customers simply because of the excellent products and services we supply. Our main goal is to ensure that you do not spend too much money on your roofing system and at the same time make sure that you will get the most out of it. We offer a 10-year warranty for each installation of a Guardian Warm Lightweight conservatory roof. If you are looking for new Conservatory Roof Tiles Newcastle and want to know more about our expert services give us a call on 01670 710050 or you can go to our website and complete the ‘How much does a Guardian roof cost?‘ and we will get in contact with you with an approximate cost. If you decide you would like to progress with your new roof one of our team will come out to you, discuss the options available to you and measure up for the production and ordering part of the process. After submitting your 5-day building notice to the Local Local Authority for Building Regulations, the manufacturing process of your roof will commence. The last step will be for you to watch us as we fit your new conservatory roof in the knowledge that you are in safe hands with the Stormshield team. We are a family run business with over 21 years experience and we pride ourselves on the professional and friendly service we give to every customer. Whether you’re looking for a conservatory roof replacement, windows, doors or require complete home interior renovations, we can help. At Stormshield we offer a personal service which is tailored made to you. If you are looking for new Conservatory Roof Tiles in Newcastle give us a call on 01670 710050 or visit our website or our showroom for more information and plenty of tiled roof examples.